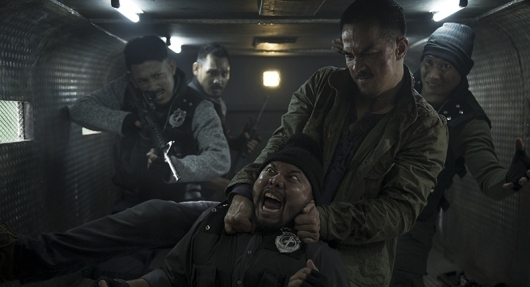 Netflix has released a trailer for The Night Comes For Us, which reunites The Raid‘s Iko Uwais and Joe Taslim for yet another Indonesian action-packed slugfest. However, Uwais and Taslim won’t be on the same squad, this time, they find themselves on opposing sides after a triad assassin spares a young girl’s life. Check out the latest trailer below. With no new The Raid films coming out in the near future, The Night Comes For Us may be the thing to see for those who want a gritty Indonesian action film. The film, which premiered at Fantastic Fest earlier this year has been praised for being bloody and brutal. Just what you want from any actioner. And it doesn’t hurt to have some of the best action stars. The film sees Taslim as a former triad assassin who must escape his boss and his gang because he spared a young girl’s life. While the plot may be somewhat familiar, the fact that we are getting another film starring Uwais and Taslim is exciting enough. Just by looking at the trailer alone, we can see that The Night Comes For Us will hold nothing back or pull any punches. Written and directed by Timo Tjahjanto (V/H/S/2, The ABCs of Death), The Night Comes For Us debuts on Netflix on October 19, 2018.